We are finally catching up to finish writing about our Japan experience… two big ones are missing, Tokyo, in this post, and Kyoto to come shortly… We got a chance to visit Tokyo twice during our stay in Japan. We spent one weekend there with a few of our friends who were visiting Japan, Annmarie, Trev and Torie. We also spent the last couple of days on the way out there. We got into Tokyo Station by Shinkansen (Bullet train) late on a friday afternoon. We really enjoyed the bullet train experience! Very comfortable and civilised, as you would expect Japan to be! When we made it in, we quickly went to drop our stuff at our hotel, the Comsoleil hotel. This is a pretty central location, with clean modern rooms, and not too expensive. After this we decided to go have a look for a famous Izakaya restaurant in the Yurakucho area… we never found it, but had a nice walk around the underworld of Tokyo. Dark streets and small night markets, full of people walking around, and even a few modern day “hostesses” welcoming businessmen to bars and restaurants. This little walk took us around the Ginza area as well. After a coupe hours walk we headed back to sleep as we were meeting the Aussie/American gang early in the morning. On day 2 we started off by heading to Asakusa. This is a temple in the north east area of Tokyo. it was nice to see, but it was very full of tourists. Its worth it though! Make sure to wash your hands and mouth before entering! Reading our fortune… it wasn’t great for most of us! Here it really was quite interesting to see all the people walking around and the random group of drummer playing something similar to a Brazilian batucada, all dressed as bullfighters… only in Japan! Since we were in the area, we headed over towards the Akihabara area (the electronics and comics area). Here we made a quick stop for Trev to buys some fireworks, for which he got an awesome deal! Then, walking into Akihabara we ran into a small noodle shop in the street, and it was amazing! It was great that the 6 people in our group occupied the entire restaurant, so we had a very nice private meal! After this, we divided our efforts and went to a local “Maid Cafe”. This is a really strange experience… Basically, its a restaurant/dessert shop where all of the waitresses are dressed as prototypical maids complete with miniskirt and squeaky voices. Once there they “take you on a magical journey” where your imagination is the limit. It was all very weird, and even a little bit uncomfortable, specially when looking at the business men in suits looking at the young girls dressed as maids. It was really a strange experience! After this, we closed the day with an amazing dinner in the Roppongi area (the bar/party area) in a teppanyaki called OMAE XEX, very highly recommended! Definitely need a reservation here though. On the final day that weekend we decided to go to the west of the city and visit the Meiji Shrine. This is a beautiful temple in the middle of a park that was built by emperor Meiji in the late 19th century. Everything about this place is amazing. Its a truly beautiful shrine that you can not miss. We even got to witness a typical japanese wedding at the shrine! Once you exit Meiji, you come out at Harajuku train station. This is a place where if you get the right time (weekend in the later morning) you get to see the Harajuku girls, all dressed up. As you keep walking down this main street, you go into Omotesando, a nice shopping areas with lots of little streets and restaurants to visit. If you are in the mood to walk, you can even get on foot to Shibuya, which is the most famous crossing, where there are millions of people on the streets (if you have seen a movie where Tokyo appears, you have seen this). After this, we went back to Kobe, but came back to Tokyo at the end of our trip, where we went to a few more places. In our return, we found we were running into one of the largest snow storms Tokyo had seen in over 30 years! It was beautiful though. The imperial palace… so peaceful! We got a chance to walk around the imperial palace and some shrines in the snow, and it was really nice as everything was very quiet and peaceful. it was also quite difficult to walk around! In this stop over in Tokyo, Mariana found an amazing Gyoza restaurant in Hrajuku that was delicious. Don’t miss going to Harajuku Gyoza Lou… don’t worry about the queue, it’ll probably go quickly and it’s worth it! When we were caught in the snow, we were looking for a restaurant and ran into this small place behind our hotel. The food was terrific (different types of skewers chosen by the chef), and while we had no clue what we would get, everything was a pleasant surprise. The waiter even braved the snow storm to get us a coke, as they didn’t have any… he ran to the nearest Family Mart! True Japanese hospitality. 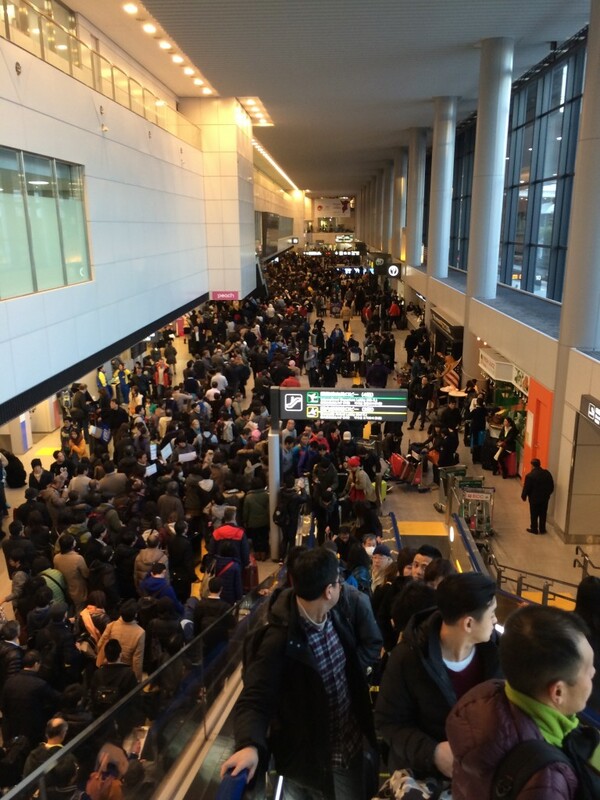 The snow storm resulted in us not being able to get to the airport, which meant an extra night in Tokyo…. but it included 5-6 hours in the train trying to get to the airport, then 12 hours of waiting there, an emergency hotel booking while running to the train, and begging and pleading to get a flight back home! It was absolute chaos! The airport during a snowstorm – crowded! It was all a magical and wonderful experience. People were so nice, and we really enjoyed our time here!